Articles on the new leader of the Charismatic signs and wonders movement. Benny Hinn in Kampala, Uganda- Was the 'crippled' man really healed? Heading Toward an Imaginary Middle East Peace Process- Imagine Benny Hinn being invited to participate in the peace talks? Benny Hinn Out of control -Again-What's going on now? Copeland's Latter Rain prophecy on Benny Hinn's program-Here we go again, fullness, healing, little Jesus', the works. Gene Edwards mystical views- Gene Edwards recently was interviewed on Benny Hinn's program on his new book. Building a Home for the Antichrist- Hinn's vision for the church to help in rebuilding the temple. The End -Time Handmaidens & Servants- Founder Gwen Shaw has been a guest on Hinn�s "This is Your Day" program, Suzanne Hinn is a member. This is very important to see what they are teaching learn their affiliations. Part 1 Benny Hinn's 2002 crusade in Hawaii-Healing, harvest, glory, Jezebel, Elijah and much much more. Part 2 of Hinn's crusade- Observations; are his teachings biblical? Are New age techniques employed for healing? Hinn and HBO- Hinn's interview with the Crouch's and his rebuttal to HBO's program on his healings.- Hinn's interview with the Crouch's and his rebuttal to HBO's program on his healings. Touch , Topple, Tilt-Looking at the enigmatic, fascinating and contradicting world of Benny Hinn. The healing Saga continues-More unbiblical and outrageous claims from the Charismatic miracle healer. Under my spell- What it is like to visit his crusade from the eyes of the discerning. The next level of Benny Hinn's anointing- Current developments that are happening when Benny Hinn is "under the anointing". Learning how to receive an offering-Learn from one of the best on how to get God's people to give extra money (Benny Hinn's way). New Video on Benny Hinn- Statements like "I am a little messiah.�. �I am a little god.� �I Am.� �Jesus Christ will appear bodily in upcoming crusades� This video explores the world of Benny Hinn to a depth that few others have gone. Are his miracle and healing claims accurate? Is his teaching biblical? Is his transferable �anointing� from God? Do his teachings and prophesies prove that he is the type of teacher Christ told us to avoid? This video features an informal, impromptu discussion of the teachings and practices of Benny Hinn and others by three apologists who have been studying Hinn for years. Jacob Prasch of Moriel Ministries, Mike Oppenheimer of Let Us Reason Ministries and Sandy Simpson of Deception In The Church Apologetics share their concerns about the current level of discernment among Christians with regard to teachers like Benny Hinn. The video takes an in depth look at Hinn's ministry for the last 10 years. Biblically refuting the doctrines and practices that have made Hinn's ministry famous. This production contains a wealth of old and new video quotes with biblically based commentary. The facts presented on this video are documented and undeniable. We believe you will find this to be a valuable resource in learning to discern whether these teachers are teaching in the SPIRIT OF TRUTH OR SPIRIT OF ERROR! This program is 140 minutes long! The price each is $25 this includes shipping and handling. 257 pages expanded and updated in its 7th edition. Which continues to grow as long as Benny Hinn continues to teach. This is a must read book for anyone who is interested in finding if Hinn's claims and stories are accurate. Time and again preachers burst onto the scene, attracting attention and followers with what they claim are new insights into Scripture and new powers from God, only to be exposed as being not only unoriginal but false. Benny Hinn, founder of Orlando Christian Center (now known as the World Outreach Center) in Florida, is the most prominent example of this phenomenon. 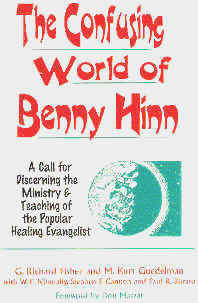 Hinn, whose charismatic church at one time numbered weekly attendance at 10,000 and whose televised services and crusades reach a potential audience of nearly 100 million homes in the United States and Canada, epitomizes the kind of histrionics, emotionalism and hysteria that can bring reproach to the Gospel of Jesus Christ. Even more damaging to his claim of "revelation" from God is the confusion which abounds in the statements and stories of preacher Benny Hinn. His propensity for exaggeration, embroidery and myth making is well documented within his many public statements and writing.